One of my former students sent an email the other day with a column she had written for a column and review wriring class she is taking here at UC. Her column is reflective of the widespread simmering anger at the Bush administration for creating this disaster by invading Iraq. In his State of the (Dis)Union address, President Bush proposed slapping a band-aid on the gashing wound that is Iraq with a “plan” to quell insurgent attacks and sectarian violence in Iraq by leading an additional 21,500 lambs to the slaughter at an annual cost of $27 billion. Aside from the fact that anyone who honestly believes we intend to pacify a restive nation of more than 27 million people with a mere 21,500 additional troops probably failed third-grade math, throwing more troops at the Iraq problem is like dropping a few sandbags on New Orleans’ levees and hoping for the best come the next Katrina. After all, despite miles of fence-building, fortification of the border with heat/motion detectors, raids by the INS and Minutemen vigilantes who’ve replaced white sheets with the American flag, illegal immigration remains at an all-time-high. If we are ever to declare a victory in Iraq and elsewhere in the world, we need to stop beating around the Bush, both literally and figuratively. Bush and fellow GOP cronies declared the answer to lie in the very greatness of America, as if the liberal institutions of government had provoked homicidal rage in fanatics incapable of embracing, freedom, democracy and the American way. But much like weapons of mass destruction and mission accomplished, wrong again Mr. President. Arabs hate us not because of who we are, but because of what we do. And what we do has very little in common with either freedom or democracy. Iraqi insurgents aren’t simply a band of ignorant desert-nomads aimed at the destruction of international freedom and democracy. They are often rational actors with clear political aims who see their task as rousing the Muslim nation to defend itself against a belligerent “Crusader-Zionist alliance” set on the humiliation, division and subordination of the lands of Islam. It does not matter if they are wrong, and I’m not entirely sure they are wrong. This is what they think. This is what the United States has given them reason to think. And we need to understand why they think this before we can ever hope to deal with them effectively. George Bush may be America’s most misguided, uninformed and reckless president to date, but he’s had plenty of company. American Presidents since William McKinley have played fast and loose with the lives of people living in foreign countries. Unwritten in the pages of any government-sanctioned history book, lies the seedy record of America’s forcible and often brutal overthrow of more than 14 nations throughout the past century. It’s a tale of imperialism, American-style, usually done in the service of corporate interests or to implement power-puppets obedient to us. We’ve supported brutal dictators in nearly every part of the globe, practiced gunboat diplomacy with the nations of Latin America while invading others outright, and put in place sanctions and air raids that would kill hundreds of thousands of innocent men, women, and children. For decades, the United States, in its obeisance to the Israeli government, has supplied weapons of mass destruction and foreign aid to Israel who then use American-made weaponry to kill people in Lebanon and Palestine. We’ve enabled groups that defy levels of human depravity, like Colombian paramilitaries who quelled dissent by hacking protestors with chainsaws and the Khmer Rouge, who slaughtered over 2 million innocent people. Deposing popularly elected leaders of other nations all the while using human beings around the world as bargaining chips is the rule, not the exception, of American foreign policy. But American propaganda techniques would make even Goebbels faint with delight. When Iranian nationalists stormed the American embassy in Tehran and proceeded to hold 52 Americans hostage, few Americans had any idea why Iranians were so angry at the country they called “the Great Satan.” They still don’t. To listen to the Republican stalwarts, one would believe the chants of “Death to America” have nothing to do with American foreign policy but were motivated by a hatred of the Bill of Rights, Vegas gambling casinos and rock ‘n’ roll. Why don’t they hate us? Our own shady history might explain why, according to a recent National Intelligence Estimate, the American invasion and occupation of Iraq has helped spawn a new generation of Islamic radicalism, amplifying the overall terrorist threat. At the onset of the Iraqi invasion, popular support for the U.S. soared to 80 percent, but has since plummeted to single digits. The same Iraqis who welcomed us on the streets of Baghdad waving handkerchiefs in the air, now wave AK-47s as they hoist up charred remains of U.S. soldiers. In his January address, Bush made it clear that it will be his successor’s job to extract the nation from the Iraqi quagmire of his making. The question remains, who will extract the next generation of Americans from Bush’s malfeasance? I was in Germany on Sept. 11 and heard from Germans about their sorrow and horror of that day. Like Americans, they could remember exactly what they were doing when they first heard news of the attacks. On a visit to Hannover, I was went looking for something to eat in the train station. At the Pizza Hut (that's right), I saw this mural of the Manhattan skyline. It appears to me that the people running and working at this particular Pizza Hut had chosen to do something to honor the memory of the World Trade Center. The newly-painted mural has two ghostly towers soaring above the city. I don't believe this would have been they way they would have been portrayed before Sept. 11. The mural presents a striking, almost defiant, image of the Twin Towers. 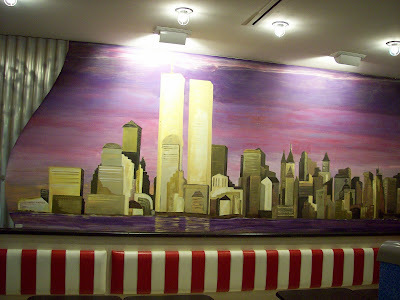 It rather looks like the mural was painted and then a decision was made that it simply didn't look right without the WTC. I may be making too much of this but this image was very striking to me when I saw it. Had my German been better, I would have thanked somebody for the mural.